Epic new comic that reads like a classic horror story. Sadie is 16 and giving birth during a series of earthquakes in Salt Lake City Utah. The earthquakes stop immediately after her son Clark is born. At the same time, a mysterious group called The Silhouette is attempting to kill Clark believing that he is the Anti-Christ. To reveal any more of the plot would ruin the surprising twists to come. 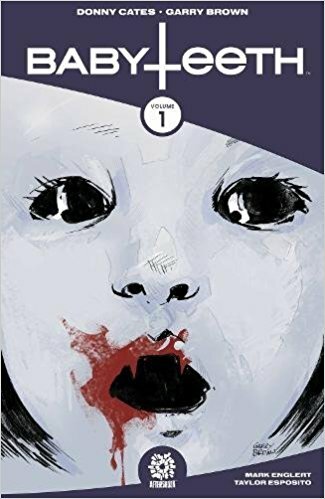 Babyteeth Vol 1 is the best horror comic I’ve read this year. I got goosebumps as good or better than when I read the first volume of The Walking Dead or Preacher. It reminds me of the end of the first Terminator movie where the mother is driving to Mexico with the ominous clouds in the rear view mirror. I can’t wait to read future volumes as we delve further into Sadie’s and Clark’s story. The characters are what make this story feel so genuine like it could be happening around the corner. It is highly recommended to anyone who enjoyed The Omen, The Terminator, The Walking Dead, Preacher or almost anything by Stephen King along with anyone who just enjoys a good tale. 5 stars! Thanks to the publisher, Aftershock Comics, and NetGalley for an advanced review copy.